Standard broadband cable TV splitters have an operational bandwidth from 5-1002Mhz. With the Modem return band enhansed performance in the 5-40MHz frequency spectrum. 6kV ring wave surge protection - All ports are protected against multiple 6 kV ring wave surges per IEEE Spec C62.41. Digital broadcast and HDTV ready - Compatible with existing and future networks. Eclipse Contact Technology (ECT) F-ports - Provides 400% more contact surface area for lower contact resistance and higher reliability. Zinc Alloy diecast housing and backplate w/ proprietary Nickel Alloy Plating - Superior corrosion resistant plating combined with a diecast backplate protects the back of the housing where corrosion is more prominet. 1.0" port to port spacing with flat port ends and 15 psi sealing of SCTE compliant F-ports - Provides an excellent mating ground plain to connectors with removed water migration into the device over time. Non-memory retaining beryllium copper center conductor seizing pin holds fast to coaxial center conductor. Intergrated mounting tabs and heavy duty ground block, providing multi-years of reliable service. 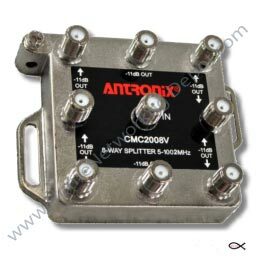 Reliability, quality and performance define the Antronix CMC2008V * output vertically ported broadband splitter. the device has been designed for today's bi-directional broadband networks. Low intermodulation distortion and 40dB of outout to output isolation prevent high powered D3 (DOCSIS 3.0) & D2 (DOCSIS 2.1) cable modems distorting same band digitial picture content from being degraded. All ports are capacitively coupled to prevent hum modulated distorition. The device equally splits and distributes CATV and OTA HDTV video to up to eight (8) devices. .